Our Neonatal team became the first transport team in the area when it started in 1979. 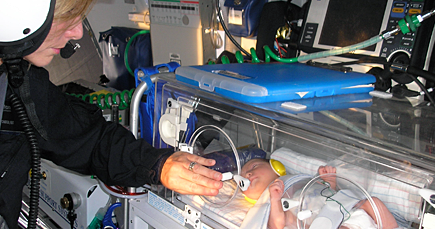 The Seton Regional Neonatal Transport Team consists of neonatal nurses and respiratory therapists specially trained in advanced airway management and stabilization of critically ill and premature neonates. We have 8 transport nurses with an average of 25 years of critical care experience and 15 years of transport experience. We have a staff of 13 Registered Respiratory Therapists who average 15 years of experience in critical care and transport of neonates. Access to the team is available 24 hours a day, 7 days a week. Primarily, we service a 19 county area surrounding Austin, but we are capable of traveling beyond this area to bring babies to one of our three Level 3 Neonatal Intensive Care Units (NICU). We have a partnership with Acadian Ambulance Services to provide us with ambulance services for ground transports. We also have a partnership with STARFlight (Austin Travis County EMS) to provide us with a helicopter for air transports. We can fly to an outlying hospital, stabilize the infant, and return to one of our three Level 3 NICU’s quickly. We have a toll free number 1-866-459-5477. What is the procedure for transport? Requests for a neonatal transport are made by calling the toll free transport line listed above. A neonatologist is available 24 hours a day, 7 days a week to answer the call. Our team of neonatologists is available for consultation as well, even if the neonate will not need to be transported. Once the decision is made to transport the neonate to one of our facilities, the decision to travel by air or ground transport is based on the following: the clinical condition of the baby, the geographical location of the referring hospital, and the weather and/or traffic conditions. Once this decision has been made, the transport team will be dispatched in a matter of minutes. When we arrive at the sending facility we work with the doctors and staff to further stabilize the patient as needed. We can continue all previously ordered medication and/or infusions enroute back to one of the Network’s Neonatal Intensive Care Units. Additional therapies can be initiated during travel; the transport isolette operates as a “mobile NICU” if needed. Seton Family of Hospitals has three Level 3 Neonatal Intensive Care units located at Brackenridge Hospital, Dell Children’s Medical Center, and Seton Medical Center of Austin. Opened in 2007, the Dell Children’s Medical Center is a state-of-the-art hospital dedicated solely to the care of children. We also have a Level 2 NICU located at Seton Northwest Hospital for babies whose condition is determine to be less critical. What is a Level 3 NICU? A level 3 neonatal intensive care unit is a special nursery for premature and sick newborns staffed by physicians (Neonatologist), nurses, and respiratory therapists specially trained to care for critically ill neonates. All of the pediatric sub specialists at the Dell Children’s Medical Center are available for consultation on infants in the NICU. Our physicians and healthcare team work around the clock to provide for your infant’s special needs. Equipment and procedures specifically designed for babies help the team treat sick newborns until they are healthy enough to go home. What is needed from the sending facility? Locate doctors and providers at Dell Children’s for patient referrals, collaboration and more.